Renee Hoeprich combined her efforts to provide a creative outlet for children through fiber art with her long-term involvement in community service and the Kids Draw for Kids (KD4K) project was born. This project didn’t have a name until Renee joined The Giving Quilt in 2012, although her efforts had already produced over 175 quilts donated to the Project Linus chapter in Carlsbad, CA. Over time, she honed the process of producing beautiful children’s art by narrowing the focus to sea life and jungle-themed quilts. For most of the students, drawing on fabric was a new experience; directed drawing helped make the process a positive one as well. The mission of KD4K of providing a creative outlet for children through fiber art within the framework of community service has now generated similar efforts within the Louisiana community. After producing nine quilts at The Giving Quilt show at the Lamar-Dixon Expo Center in April 2013, Renee and Sharon Hicks, chapter coordinator of Quilts for Kids, worked with Jefferson Terrace Elementary School students to produce artwork for several quilts. Please click To Make a Difference to view an interview featuring Renee's work with the program. Other events include the following. The Sassi Strippers Quilt Guild included the project with other community-based activities at their annual quilt show in August 2013. The Jones Creek Branch of the East Baton Rouge Parish Library System hosted a KD4K event on September 14, 2013. Gulf States Quilting Associations sponsored KD4K in March 2014 at their biennial show in Slidell. 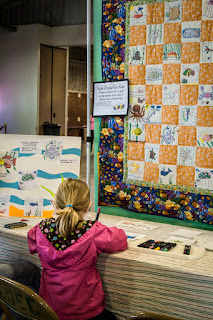 The Giving Quilt hosted the event at the February 2015 quilt show at the Lamar Dixon Expo Center in Gonzales. For more information about TGQ activities or KD4K, please visit the website www.thegivingquiltinc.org or contact Renee Hoeprich reneehoeprich@yahoo.com (760-815-5305/225-810-3929). Please see below for a KD4K materials list that can be downloaded and printed.